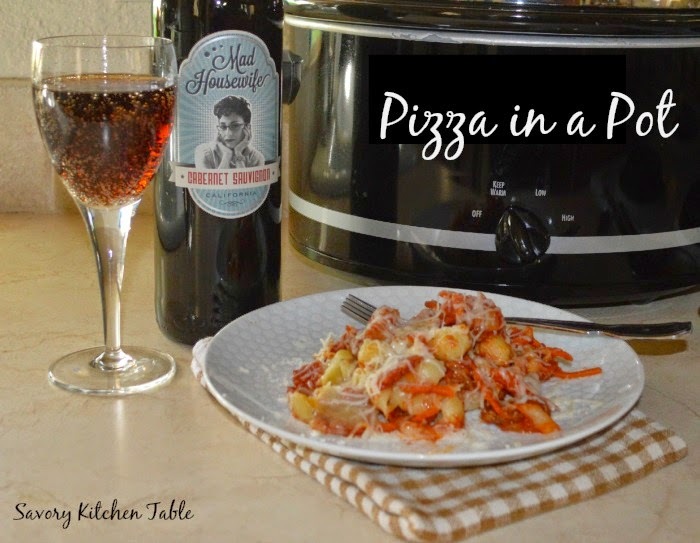 Sandra over at Diary of a Stay at Home Mom recently ran her recipe for Pizza in a Pot. It sounded SOOOOOOOO good and looked so unbelievably delicious that I wanted to make it right then and it was only 8AM. My biggest problem is that with a major move coming I've been using what I already have in the freezer and cupboard for anything and everything I make so I had to adjust it a bit, but we loved the results. I also halved everything and we still will eat on it for 3 days. I can't wait to make it again with her original ingredients. Our favorite pizza is a pepperoni/sausage combo and ironically when hubby came in he asked if we were having pizza for dinner! In a large skillet, cook the Italian Sausage and onion over medium heat until meat is no longer pink, drain well. Stir in the tomato sauce, tomato paste and broth. In a 5-qt. slow cooker, layer the pasta, sausage mixture, pepperoni and cheese. Sandra's note: If you'd like, substitute 1/2 pound bulk Italian sausage for the pepperoni in Pizza in a Pot. Cook it along with the ground beef, green pepper and onion.